Israeli Prime Minister Benjamin Netanyahu has accused the Jerusalem office of the Qatari-owned network Al Jazeera of fueling ongoing unrest at the Temple Mount and threatened to draw up legislation that would allow him to shut it down. In a Facebook post Wednesday, the Israeli PM wrote that he has long sought to shut down Al Jazeera, but was unable to do so due to an insufficient legal framework. “The Al-Jazeera network does not cease to incite to violence around the Temple Mount. I have appealed to law enforcement agencies several times to close the Al-Jazeera office in Jerusalem. If this is not done due to legal interpretation, I will work to enact the necessary laws to remove Al-Jazeera from Israel,” Netanyahu wrote, as cited by Arutz Sheva. Al-Jazeera said that the Israeli politician's "hostile and arbitary statements" were "yet another episode of the ongoing vicious attack" on the channel, whose closure has been demanded by other Gulf states. "Al Jazeera stresses that it would take all necessary legal measures in case they act on their threat," it said on its website. "The network moreover reiterates that it will continue covering the news and events of the occupied Palestinian territories, and elsewhere, both professionally and objectively." The threat comes as the Israeli authorities struggle to quell mass protests outside Al-Aqsa mosque against the new tough security measures. Those were imposed by Israel at the Temple Mount in response to the killing of two policemen outside the compound by Arab Israelis last week. As part of the measure, metal detectors and CCTV cameras were installed at the site, considered to be the third most sacred in Islam. The move gave rise to massive protest engulfing the West Bank and the Temple Mount, with Muslims staging prayers outside the mosque and refusing to enter the compound. 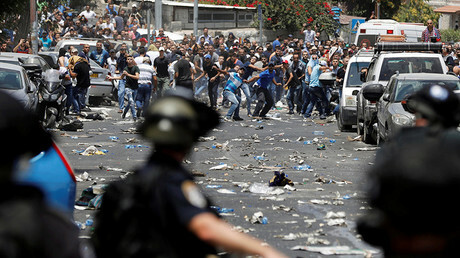 Scores of Palestinians were injured and at least three died amid the scuffles, while the Palestinian Authority vowing to cut off all contacts with Tel Al Aviv until the dispute is resolved. The concession, however, yielded few results, with worshipers still gathering outside the mosque for prayer on Wednesday in protest. The decision also did not sit well with an overwhelming majority of Israelis, who initially supported Netanyahu while he was boosting security at Temple Mount. 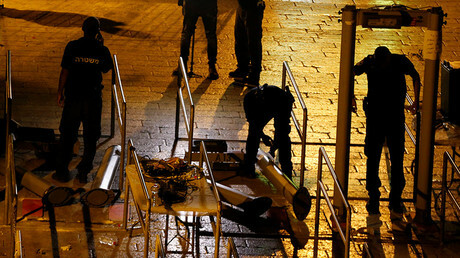 A survey by Israel’s Channel 2 showed that 68 percent of adult Israelis were in favor of installing metal detectors while 77 percent of the respondents likened the decision to remove them to a capitulation by the government. While Netanyahu publicly voiced his intent to close the Al Jazeera office on Wednesday, there have been reports in the Israeli media that the PM instructed the Foreign Ministry and other authorities to look into the matter more closely as early as last month. At the time, Defense Minister Avigdor Liberman backed the idea, calling the Qatari channel “a propaganda outfit in the style of the Soviets or Nazi Germany” that is “biased and hostile” on Israel and silent on Iran. By threatening Al Jazeera, Netanyahu follows in the footsteps of the Saudi-led bloc of nations in its wide-ranging conflict with Qatar, which has accused Doha of supporting terrorism. Al Jazeera offices were shut down in Saudi Arabia and Jordan and its websites were blocked in several Arab countries that have joined the blockade. Shutting down Al Jazeera was initially among the pre-conditions submitted by Saudi Arabia, the United Arab Emirates, Bahrain and Egypt to Qatar as part of a 13-point ultimatum. Later, however, the demand was dropped with the UAE minister for the federal national council, Noura al-Kaabi, saying that the countries would be satisfied with a complete overhaul of the channel rather than its closure.